Around the end of 2003, my wife made a serious mistake. She came up with a home improvement project where we'd remodel the basement family room into a home theater. I'd been looking at projectors and surround sound systems for a while and she'd wanted the basement remodeled for a while -- a "while" meaning "years." The agreement was that I had to stay reasonable in cost for the equipment. Thus, our personal entertainment area was born. The first thing we did was remove all the existing trim so it could be painted separately. Next, we taped over the counters and cabinets that were not being painted. Then we put a coat of Kilz 2 Latex Primer. Normally, I'm not all that picky about the type of primer used, but this was going over the fairly slick surface of hardwood paneling. We needed something the base paint would stick to and Kilz 2 is wonderful stuff though a bit pricey. The color needs to be pretty dark for a home theater where a projector is used. However, the area was so big, that just using a single dark color would be just too much of one thing. So we decided to try something a little different and something we've never done before. We used Behr's Faux Finish Venetian Plaster technique. This technique starts with a base coat of a solid color and adds a second coat of an accent color which will then be sponged or blotted with a damp towel to get the effect. For our purposes, we needed a dark wall, so the which consists of a lighter base coat and a darker faux finish coat. If you look at the site, there's a section that talks about How to Create a Venetian Plaster Finish. Near the bottom of that section, it is mentioned that a water-dampened rag is used. We used Scott's Rags in a Box for this. They were perfect for this job. They are a little stiffer than cloth rags and removed the top coat very easy. We got a great effect. We were a bit worried that the glaze in the top coat would leave a shiny, reflective surface, but in reality, it dries to a very matte finish. Since we were running with a budget, we decided just to paint the baseboard and crown molding rather than buy new. We did buy a couple of pieces of baseboard and crown molding to cover areas not covered before plus some new cove and outside corner pieces. We bought got a couple fancy scroll work trim pieces, too. I was rather surprised just how good the old varnished wood looked with a coat of paint. That meant, I didn't have to cut it to fit either. Here again, the key was to use a dark color. I'm sure there are more pictures here than anyone would ever care to look at. Once it was painted, it was time to start putting it back up. It really went up with no problems since most of it went right back where it came from. The fun part was touching up the paint over all the little nail holes filled with white painter's putty. Again, there are way more pictures here than you probably care to look at. Update on June 7, 2009: It's interesting to note that the Onkyo HT-S760 system is still going strong. Too bad about Circuit City though. This probably was my last major purchase there, which is somewhat telling. The budget aspect of this project put some definite limits on what could be bought for the audio surround sound and video projectors. The surround sound system is an Onkyo HT-S760 (Black model). We got it from Circuit City for $523. The side and rear speakers have been rated by others as somewhat weak, but the front, center and sub-woofer are given decent marks. I figured I could always replace the side and rear speakers later if that is the case. The A/V receiver (the Onkyo HT-R510) has tons of audio and video inputs and outputs, and I plan on using most of them. I didn't run all those cables for nothing. 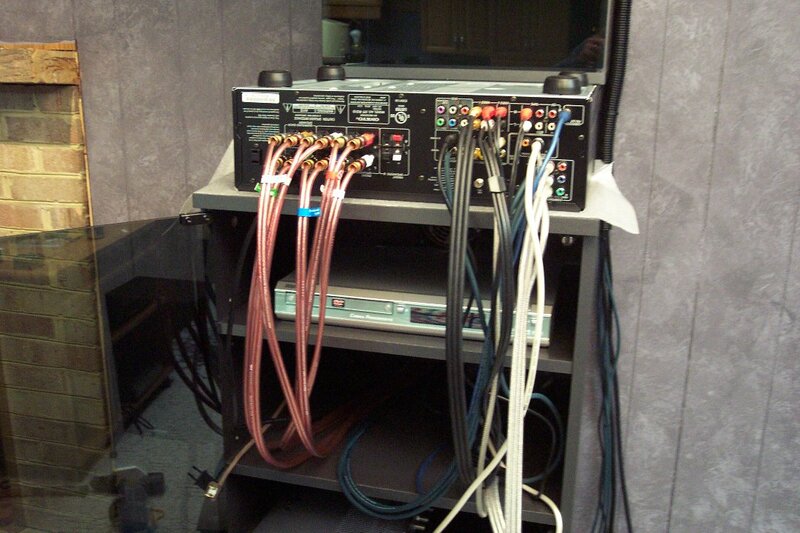 The easiest way for me to do this was to pull the cables through the equipment cabinet and to flip the A/V receiver upside down on the cabinet. Once everything was hooked up, it was easy enough to fish the cables back out of the back of cabinet. Update on June 22, 2013: The PLV-Z1 was very successful for Sanyo. It was followed by the Z2, the Z4 and Z5. Late in 2008, the Z5 was replaced with the Sanyo PLV-Z60, which is a 720p projector. We replaced the PLV-Z1 (which still worked) in June 2013 with a BenQ W1070 1080P Projector. (The link is to the newer model, the W1070+.) Like the PLV-Z1 is has a short throw lens and has the lens shift that made the Z1 so easy to center. Turning our attention to the video projector, after weeks of scouring home theater sites and user forums, we decided on the Sanyo PLV-Z1. I purchased this projector from B&H Photo-Video for $1100. B&H also kicked in a Sanyo DVD-8000 DVD player (with surround sound). Our current DVD player was a bit iffy in this new setup, so the freebie was definitely welcome. The PLV-Z1 is a "1/4 HD" projector with an actual resolution of 964x544 (where 1/4 the pixel resolution of the full 1920x1080 HD size is really 960x540). It does a wonderful job of scaling HD content down because of this. One of the key selling points for me was the Z1's short throw lens. Because of the bulkhead in the middle of the room, it would be difficult to mount the projector much farther back from that. With the Z1 mounted as far back on that as possible on the bulkhead (which also bolted it into the main beam of the house), the distance was just about 11 feet to the screen. At that distance and with this lens, the picture was 110" diagonally. That'll do. For the temporary screen, we turned to Ebay and Home Depot. We bought a bolt of 54" wide white matte non-perforated screen material from Dazian Fabrics. I think the piece was 110" long. We bought a number of 1"x3" strips from Home Depot. We found that buying the more expensive type of wood (Maple?) gave us much sturdier and straighter pieces. Fastening those together with the appropriate L's and T's made a good frame to stretch the fabric over. We lapped the fabric just over the edge and stapled it in place with an electric staple gun. Use lots of staples and continue to stretch the fabric tight as you go along. As a final touch, we used black electrical tape to cover the staples on the edge of the frame. Altogether, this cost under $100, but it looks very good. To quote Hannibal, leader of the A-Team, "I love it when a plan comes together." The sound system sounds good and the projector looks great on the homemade screen. To house the A/V equipment and provide storage for movies, game consoles and remotes, we purchased an equipment cabinet, several types of wall storage, and a floor unit (meant to hold a TV as an entertainment center) from Ikea. These were all from the Kaxås line, which just by happenstance, had a gunmetal gray version that matched the wall color perfectly. The fortunate thing about Ikea furniture is it's inexpensive. The bad thing about Ikea furniture is they drop and add models all the time. We went back later in the year to get some more of the DVD/CD storage cabinets, and they had closed out the line entirely. We've never found anything close ever again. Once we got everything put together and cleaned up the area, we had a very nice home theater for around $2,000. We would be remiss if we didn't include a few pictures of the projector working. Unfortunately, our camera doesn't work all that well in the dark. We need to get a better camera. Next project maybe? The next step is to tune in all the colors and set up the audio balance. We already noticed that the projector favors green. At least, we've got some cool new toys!